Some people are naturally good at seeing the silver lining in every dark cloud. When things seem difficult they can look at where the light is still shining and realize that there is hope for things to be better. Others are more drawn to the negative and can have a hard time really find where the positive lies in these harsh situations. 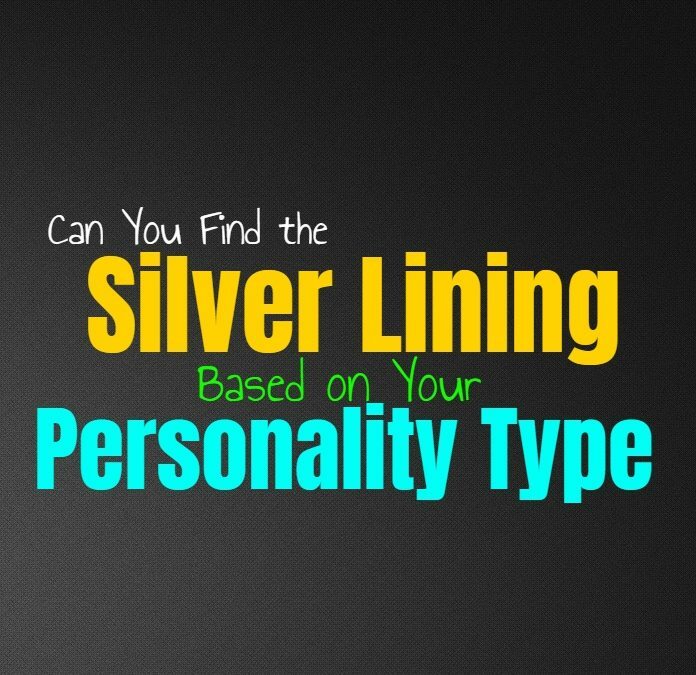 Here is how good you are at finding the silver lining, based on your personality type. INFJs can sometimes struggle to see the silver lining in their own lives, but can find it for the people they love. They do their best to make things positive for those around them and don’t want to do or say anything which might be disappointing for them. When the INFJs loved ones really needs a pep talk or someone who can find the silver lining, they certainly will do their best to provide this for them. They do sometimes struggle to find their own silver lining though, and need someone who can help them see the positive when they are feeling a bit sorry for themselves. ENFJs try their best to see the silver lining in every situation, mostly so that they can continue moving forward. They don’t want to let others down or fail the people they care about most. Because of their desire to always take care of others and live up to their rather high standards, ENFJs try their best to remain positive about things. ENFJs will try to see the silver lining if it will help those around them feel happier about the situation as well. They do sometimes struggle to see this within their own mistakes, but they don’t want others to recognize this. INFPs do try to look for the silver lining when they can, but sometimes it just isn’t easy for them. They need to feel their emotions and so sometimes this means accepting them instead of trying to see the positivity. INFPs likely won’t see the silver lining right away, and need time to come to this conclusion. At first they see the dark cloud and need to accept it and understand it better before they can move towards being positive about the situation. ENFPs do like being positive when they can be, but sometimes it’s difficult for them to find the silver lining. When they are struggling they need to really accept the emotions, instead of just trying to spin it as positive. After some time the ENFP will be able to find the silver lining and will do their best to move forward and grow from the situation in the ways they need to. For the ENFP it is important to keep moving forward and so they don’t want to become caught up on negativity and the pain of something. INTJs are realistic much more than optimists, and so the silver lining isn’t something they can always find. They do often see a silver lining in the ways they can learn from a situation though, since they work hard to always grow and improve. For the most part they look at the situation from a logical and factual point of view, and dislike searching for unnecessary silver linings. ENTJS are far more focused on facts than they are on simply being positive. They believe in being accurate and won’t just search for a silver lining to be happy or upbeat, instead they want to be realistic about the situation. If they have a problem they need to solve the ENTJ wants to be accurate and unbiased so that they can move forward towards their goals. For them searching for a silver lining can seem wasteful, but they are capable of seeing everything as a learning experience. INTPs really don’t look for the silver lining when they would rather look at things logically. For them just trying to be positive is including too much emotion in the situation and it will result in being inaccurate. They want to analyze objectively and figure out how to solve their problems. INTPs can definitely struggle to see the silver lining, unless they have someone who helps inspire this in them. ENTPs often focus on facts and logic but that doesn’t mean they are incapable of finding a silver lining. They often see the silver lining in the ways they have learned from a situation, since ENTP value growth in their lives. If they can see ways to learn from their negative circumstances then the ENTP will take this as their silver lining. ISTJs aren’t the types to just search for a silver lining, since they are much more realistic and practical people. They believe in viewing things as they are and prefer to focus on facts. When someone constantly tries to be positive about everything, this can actually be a bit exhausting and even annoying for the ISTJ. ESTJs definitely prefer to focus on the facts of a situation rather than just search for a silver lining. For them it feels unrealistic and foolish to constantly try and remain positive when they should be accurate. ESTJs believe in solving problems and don’t like allowing themselves to lose sight of what matters. While they are capable of overcoming struggles they face, they don’t want to pretend that sometimes is more positive than it actually is simply to comfort themselves falsely. ISFJs do try to remain positive, especially for the sake of their loved ones. They don’t like letting others down and so sometimes searching for the silver lining helps make the situation seem more upbeat. Even though ISFJs can be hard on themselves, they would rather search for the positive in order to maintain a sense of calm and harmony in their environment. Constant negativity only makes the situation feel worse for them and those around them. ESFJs do sometimes try and search for the silver lining, especially when it comes to their loved ones. They want to help them remain positive and see the good in their lives. Sometimes it can be difficult for the ESFJ to see the silver linings in their own lives, especially when they are feeling overwhelmed by a situation. They can be rather hard on themselves so sometimes they find themselves struggling to see the positive in their circumstances. ISTPs can try to remain positive but they are often more realistic people. They can often see where they might learn from a situation and this is often the silver lining they find. ISTPs are realistic people most of the time, who prefer to look at the facts. This doesn’t make them negative, but it also doesn’t cause them to be obsessed with finding positivity where there isn’t any. Instead they want to be smart and logical, and find a way to solve whichever problems might be in their way. ESTPs are more realistic than they are overly positive, and so they don’t always want to search for that silver lining. They are often better at finding the silver lining when it comes to the lives of their loved ones, but this is simply because they want to make them happy. ESTPs don’t like letting down the people they care for, and so they do their best to find the silver lining when it seems like the most useful choice. ISFPs do try and remain positive and do their best to always see the silver lining in any dark cloud. It can be hard sometimes when they are feeling beaten down or overwhelmed by a situation, but they try their best to keep moving forward. If the ISFP continues to struggle they might not find it as easy to see the silver lining, but this often takes a long time for them to even feel this negative about something. ESFPs are often amazing at finding the silver lining in just about every situation. They try to remain positive even when things feel dark, and always find themselves looking towards the light which might be hiding from most people. ESFPs are positive and full of life, and always want to see the best in the world around them. It takes a lot for the ESFP to get knocked down so hard that they cannot find the silver lining in their situation.